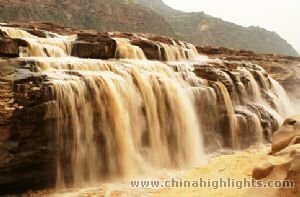 The Yellow River civilization is one of the oldest in the world, and is also the main source of Chinese civilization. In Chinese history, the Yellow River is not just a river; it stands for the origins of culture and civilization. It played an important role in the early development of Chinese civilization. 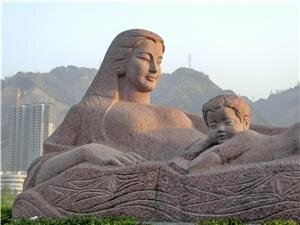 Chinese refer to the Yellow river as "the Mother River" and "the Cradle of Chinese Civilization". 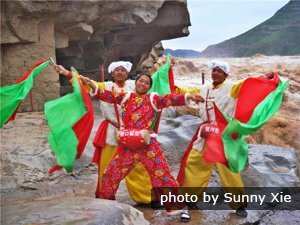 That is because the Yellow River was the birthplace of ancient Chinese civilizations in the Xia (2100–1600 BC) and Shang (1600–1046 BC) eras — the most prosperous region in early Chinese history. 2 million years ago prehistoric (Peking) man is shown to have lived in the Yellow River Basin. Moreover, the Chinese regard yellow as a color of ancient origins: an emblem of the loess land the Yellow River flows through, the emperor, the yellow skin of Chinese, and the legendary Chinese Dragon, from which Chinese are said to descend from. Yellow River civilization, i.e. early Chinese civilization, originated from the middle and lower reaches of the river, and then spread across China, East Asia, and has even taken root in many corners of the Western world. Gunpowder, the compass, paper making, and printing — all of these inventions not only promoted Chinese cultural development, but also spread to the rest of the world, making an important contribution to the development of humankind. Yellow River civilization developed from the Neolithic Age, over 3,000 years ago, when a lot of regional cultures were booming. Some were consumed, and others became extinct, as "China" grew. During the development and fusion of many other cultures in the expansion and assimilation period, Yellow River civilization developed through the Zhou Dynasty (1045–256 BC), until the unification of China. In agriculture and technology, the Yellow River civilization was more advanced and progressive compared with the other contemporary civilizations in the world. Therefore, the Yellow River civilization of around 3,000 years ago was called "the precocious civilization". Then China was ruled from Xi&apos;an, still in the Yellow River&apos;s basin, for most of the next 1,000 years. Yellow River civilization in Neolithic times is divided into regional "cultures" (mini civilizations) according to archaeological evidence. Civilization in the early Neolithic age (6000–5000 BC) is represented by the Peiligang Culture; in the middle Neolithic age (5000–3000 BC) by the Yangshao Culture; and in the latter Neolithic age (3000–800 BC) by the Longshan Culture. 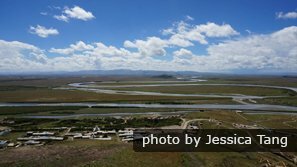 The Peiligang culture was so named as it was excavated in Peiligang Village, just south of Zhengzhou, now the Yellow River&apos;s biggest city. It is characterized by vertical cave dwellings, growing grain crops, as well as shiny reddish-brown pottery and polished stone implements. Laoguantai Culture was found in the Laoguantai Village ruins in Xihua County, just east of Xi&apos;an. Focused on primitive agriculture, they had stone knives, stone spades, and stone axes. Their ceramics were very primitive, mainly using clay tablet patches. Ring foot bowls, painted pottery pots, and three-legged pots were the most characteristic types. Their houses were round, as were their pits for storing things. Their dead were buried in rectangular pits with pottery and other articles. The most representative site is in Beixin, Teng County, Zaozhuang Prefecture, Shandong Province (400 km east of Zhengzhou and 300 km south of Jinan). Beixin Culture dwellings were all half-crypt caves. Rectangular pits without coffins were popular for burials. Stone implements, and then bone, horn, teeth and clam tools were developed. Grinding was the main type of craftsmanship, and tan-colored potter was typical. The representative site is in Cishan, Wuan County, Hebei Province. Their life mainly focused on primitive agriculture and grain was the main crop. Stone sickles, stone shovels, stone knives, stone axes, and willow-leaf-shaped stone millstones were the main implements. Their stone millstones were unique in shape, being three or four feet in diameter. They raised dogs, pigs, and other livestock, and also went fishing and hunting. Their ceramics were made manually, and were comparatively primitive. Oval spittoons, three-legged bowls, and deep-bellied pots were their typical pottery items, mostly adorned with cord patterns, fine-toothed comb patterns, and scratches. Their dwellings were round or oval caves. The Yangshao culture was discovered in Yangshao Village, Henan Province (between Sanmenxia and Luoyang) in 1921, and it is characterized by its painted pottery, usually red. People from the Yangshao period lived a settled life, and formed villages of a certain size and layout. Primitive agriculture was their main occupation, and they also raised livestock and went fishing, hunting, and gathering. Their main tools were polished stone implements and pottery. The representative site is in Hougang, Anyang Prefecture, Henan Province. It developed from the Beixin Culture with some new developments: round cave dwellings and unique pottery. The representative site is in Dawenkou, Tai&apos;an County, Shandong Province. In the early period, red pottery was popular and, in the later period, black and gray pottery was. Eggshell black pottery cups with high legs made in the later period were exquisite and beautiful, being continued by the later Longshan Culture in Shandong. The Yueshi Culture and the Longshan Culture were discovered at the same time. The representative site is in Dongyueshi Village, Pingdu Prefecture, Shandong Province. Yueshi Culture pottery was mainly simple, elegant, and massive in style. The sandy terracotta and clay pottery were most notable and quite different: the sandy terracotta was hasty and rough, while the clay pottery was simple and exquisite. Presumably, they were products of different workshops. Snap fasteners, convex edges, overlapped lips, convex bottom margins, and the round and blunt style were unique features of the Yueshi culture. Longshan culture was discovered in Longshan Town, Zhangqiu County, Shandong Province by the Research Institute of History and Language of the Central Academy in 1930. It was characterized by its black and gray potteries, and in the later period, the residents also began to cast bronzeware. In 1959, the Erlitou culture was discovered in Erlitou, Yanshi Prefecture, Henan Province. The site is about 2,000 meters in radius, with the remains of two palaces in the center. Scholars think that they inherited both the Nanlongshan Culture of West Shanxi and the Longshan Culture of Henan, as they could cast bronzeware. The Shang Dynasty (1600–1046 BC) was the major kingdom in the middle and lower reaches of the Yellow River. The state apparatus of the Shang Dynasty was highly developed, especially the maturity of the ritual and rank system. Cities started to appear and became larger. Writing (inscriptions on bones or tortoise shells) was developed, and so was agriculture and their handicraft industry. The appearance of highly-complicated, exquisite, heavy bronzeware marked its progress technology and cultural richness. As the Shang Dynasty further enlarged its territory, the civilization of the Shang Dynasty also started to influence the west and the north as well as the Yangtze River basin. It was the pre-Shang and early Shang culture in Hebei Province, extending from the east of the Taihang Mountains to the Bohai Bay. It was the early Shang culture with sites in Zhengzhou and Yanshi as its center. Sandy and clay gray pottery were the main ceramics. It was a late-Shang culture with the Yinxu site in Anyang (capital of the Shang Dynasty) as its center. It was the first civilization in China with systematical contemporary written records. It was the civilization of the pre-Zhou and early Western Zhou Dynasty period, discovered in the Central Shaanxi Plain. The Zhou Dynasty (1046–256 BC) mostly descended from the Shang Dynasty institutionally. Its regional power grew, and its civil ethics and rites were developed. In both the Shang and Zhou dynasties, there were signs that the civilization of the Central Plains (Yellow River) had fused and mingled with the civilizations in the surrounding regions. During the Zhou Dynasty the Yellow River Civilization&apos;s neighbors were brought into hegemony: the western nomads in the north, the Shu civilization in the west (like the Sanxingdui civilization in Sichuan Province), the Yangtze River basin civilization in the south, and Pearl River basin civilization in today&apos;s Guangdong Province in the south.